CLEVELAND BLACKSMITHING, LLC is a community-learning blacksmith shop open to all those intersted in art, blacksmithing, and metalworking. Located in Cleveland's historic neighborhood of Ohio City, we offer a variety of blacksmith classes, private lessons, group sessions, welding instruction, commissioned architectural ironwork and custom sculpture. 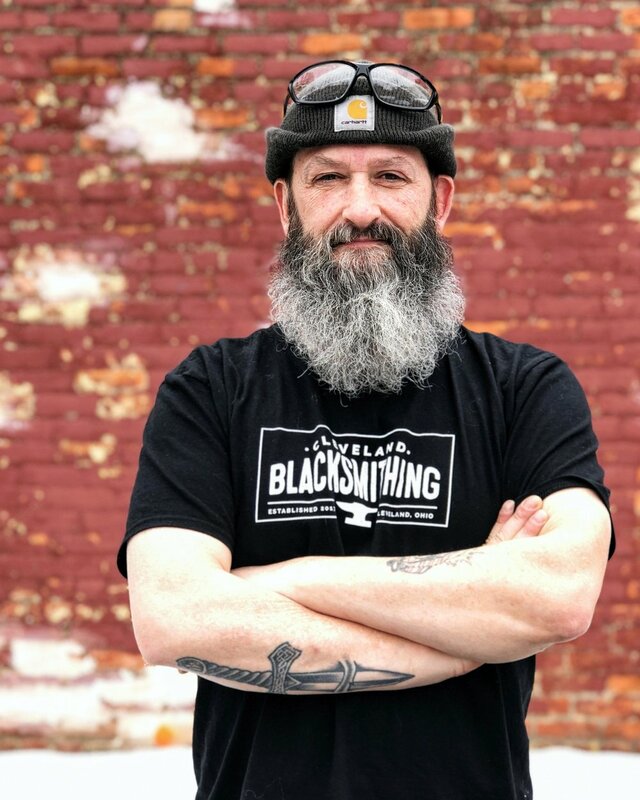 Run by husband and wife team Gavin and Brooke Lehman, Gavin leads classes and commissioned ironwork drawing on his education and 23 years of experience as a working artisan-blacksmith. While Brooke, a professional graphic designer and creative entrepreneur, is at the forefront of business affairs. Putting her 15 year design-driven career to use, she runs marketing, programming, development, and member services. As a Blacksmith for over 22 years, his work is almost exclusively hand-forged wrought iron. A product of the Rust Belt and Cleveland, Ohio few creative media could be more appropriate than iron. The products of his studio and shop are almost exclusively custom, privately commissioned ironworks ranging from railing systems to drawer pulls and everything in between. In design and direction, his work is largely based upon exploring and harmonizing relationships, both philosophical and visual. A few select public shows are done from time to time in order to show current trends and experimental works and to sell limited runs various designer home décor, furniture, etc. "Amongst the relationship developments relevant in my work are; harmonizing the traditional methodologies of blacksmithing with the aesthetics and ideals of contemporary design; unifying the form of an object, its surroundings and its function; and exploring the visual dualities between the organic and the mechanical. All of these relationships work towards giving each of my pieces direction and relevance within the spheres of both contemporary Art and Fine Craft. " Gavin has a BFA in Studio Art with a minor in Business Administration from Baldwin Wallace University and is a certified welder and graduate of the Lincoln Electric Welding School. As a professional graphic designer & creative entrepreneur living and working in Cleveland, Brooke’s superpower is turning creative ideas into viable businesses through branding, strategic planning, and compelling design. From marketing and programming to forging and welding, she is at the forefront of business affairs. 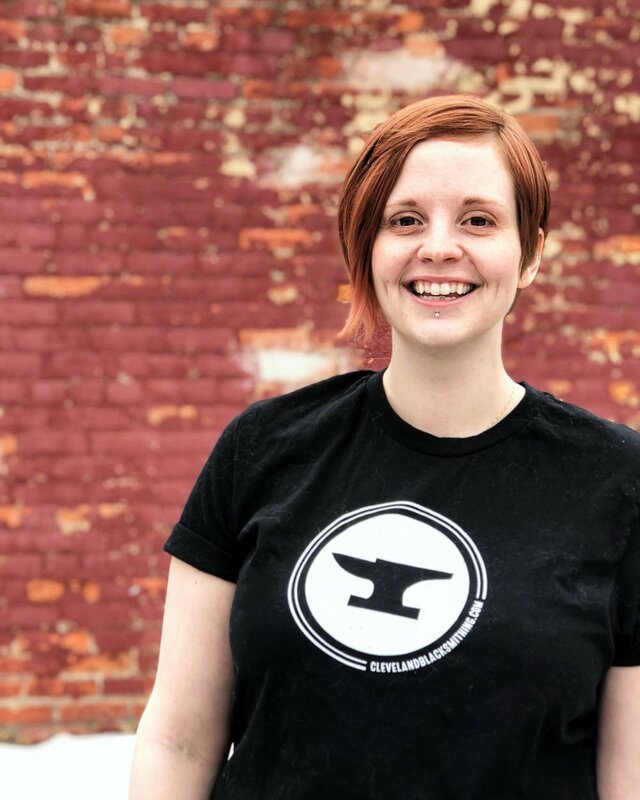 Even though managing a community-learning blacksmith shop is the newest venture in her career, Brooke is a 15 year creative business veteran. Throughout her career, Brooke has created and launched several popular product lines and owns a shamefully successful Etsy shop ranking #32 in the Handmade Art category. She freelances web design, small business branding and startup consulting, and licenses her typography and illustrations exclusively for stationery, fabric, and home decor with an art agency based in Chicago. In 2016 co-founded Lush & Lovely Floristry, a trending flower in Ohio City. In 2018, she attended Lincoln Electric Weld School. 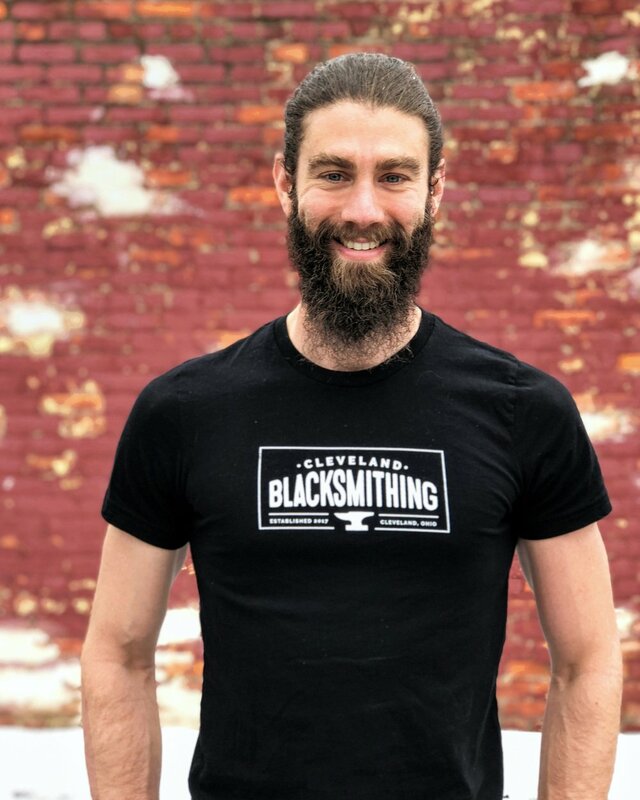 George, a multi-skilled craftsman, took his first blacksmithing class with Gavin at the Cleveland Institute of Art in 2015 and continued to pursue his passion through private lessons in both forging and welding. George works full-time for Hyland Software as a QA Analyst and when not spending time with his lovely wife and dogs, you’ll find him at the shop forging, laughing, and befriending anyone who comes through the door. He’s the nicest guy ever. You’ll love him. Gunther started working at the shop almost a year ago and he's been hooked like a lamprey ever since! Starting with private lessons, Gunther explores metalwork through processes such as forging, casting, and most recently, welding. A recent graduate of Lincoln Electric welding school, Gunther works with us as a shop technician mostly during the day, but frequents the shop in the evenings cuz he’s cool like that. When he's not blacksmithing, he's likely fishing, gardening, or playing video games. Gunther lives just around the corner in Gordon Square. Brad came across our Beginners Blacksmithing class last year and quickly joined our membership program. After witnessing Brad’s dedication and natural aptitude for the craft, we brought him on as a shop tech and he’s been forging with us ever since. Brad lives in Lakewood and works as a Quality Control and R&D scientist for a materials company, making glass/ceramic for anything from stove tops to electronics. When he’s not working or playing with a hammer and anvil, he’s out running, biking or rock climbing. John came to us as part of an internship through the University of Akron, where he is pursuing a Bachelor of Arts in Studio Art with a minor in Metalsmithing. He has a diverse background, including construction work, truck driving, information technology, and military service. However, John had always had an interest in art and decided it was time to pursue his passion for the creative! As he learned about various techniques in his metalsmithing courses, John became drawn to blacksmithing. Blacksmithing appeals to his interest in tradition, the creative process, and metal work.